Tokushima (徳島) is the capital of Tokushima prefecture. It is located eastern prefecture that is the entrance of Tokushima. 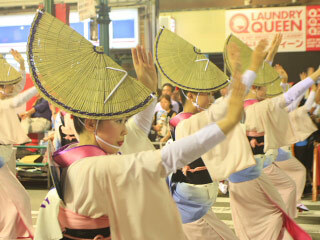 The most famous feature of Tokushima is Awaodori. Awaodori is 400 years old dance festival. In the middle of August, everyone in Tokushima joins the festival. Naruto (鳴門) is the gate of Seto Inland Sea. The spiral of Naruto Strait is the most popular object in Tokushima. Use Sanyo Express Way to Seto Chuo Express Way to Takamatsu Express. Exit at Naruto. Use JR Setoohashi Line to Utazu Station. Change JR Yosan Line to Takamatsu Station. Change JR Kotoku Line to Tokushima.